Ashley Dowling, an associate professor of entomology and researcher with the Arkansas Agricultural Experiment Station, is the primary investigator on that study. He said three to five years’ worth of data is required to provide an accurate picture of the prevalence of tickborn pathogens throughout Arkansas. Dowling said he hoped to deliver a new batch of several thousand tick collection kits to extension offices this spring. The study was constructed to use a “citizen-scientist” model, in which Arkansans of all walks of life were encouraged to participate in the study by collecting ticks they encountered. Ticks were collected throughout the state, with kits supplied through the Cooperative Extension Service. Dowling said the research team initially sent about 40-50 collection kits to each of the more that 75 Cooperative Extension Service offices throughout Arkansas. “Some counties were immediately requesting more kits,” Dowling said, while other counties returned few if any of the kits. Arkansas is a tickborn illness "hot spot"
Dowling said the U.S. Centers for Disease Control and Prevention considers Arkansas and its neighboring states are a “hot spot” for tickborn illness, including spotted fever, ehrlichiosis, tularemia and others. “We’re typically No. 1 in any given year,” Dowling said. “We don’t want dots on the map that can be linked to a specific tick — that’s a common thing that happens,” Dowling said. “But this study isn’t intended as a diagnostic service. An online map that maps where various species of ticks have been collected and identified in Arkansas can be accessed at http://bit.ly/2Uz7jjd. As the research team processes the ticks for various bacterial pathogens, additional layers will be added to the online map to reflect those findings. 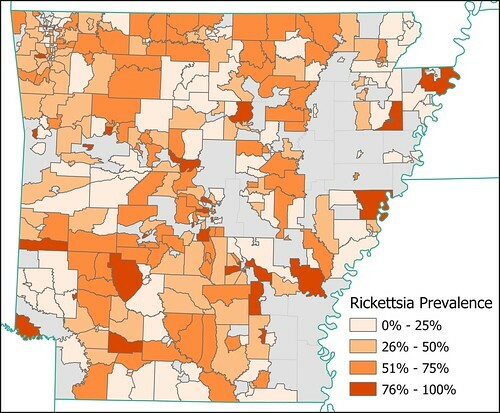 A static map displaying the prevalence of rickettsia can be seen at https://flic.kr/p/2dTsdj6. Currently, the study is only scanning the collected ticks for bacterial pathogens, although both the Arkansas Department of Health and the CDC, Dowling said, have expressed interest in seeing the Division of Agriculture team expand the research to include viral pathogens as well. In 2018, researchers confirmed the presence of the Longhorned tick (Haemaphysalis longicornis) in Benton County, Arkansas. The tick, which is known to carry and transmit both viral and bacterial tickborne diseases, is native to East Asia and was first detected in the United States in 2017. To date, however, only one Longhorned tick nymph has been confirmed in Arkansas, Loftin said this week. Despite the new arrival, Loftin said that residents should simply continue to exercise the same precautions they would with the state’s existing tick population. Recommended preventive measures include wearing long-sleeved shirts and long pants, tucking pants into socks, and applying insect repellent to both skin and clothes. Individuals should inspect themselves for ticks thoroughly as soon as possible after potential exposure. Additionally, residents should maintain an effective tick control program on pets that are allowed outdoors. Keep piles of wood or rubbish should be kept far away from animals and homes, as they tend to serve as shelter or habitats for rodents, which can carry ticks, insects and disease. To learn more about research being conducted by the Arkansas Agricultural Research Station, visit https://aaes.uark.edu/. To learn about ticks and other insects in Arkansas, contact your local Cooperative Extension Service agent or visit www.uaex.edu. Follow us on Twitter at @UAEX_edu.